Radio station 88.5 WFDD has been honored with two regional Edward R. Murrow Awards, including “Overall Excellence” and “Newscast” categories. The Radio Television Digital News Association awards are among the most prestigious in broadcast and digital news. The Murrow Awards are the embodiment of the values, principles, and standards set forth by Edward R. Murrow, a journalism pioneer who set the standards for the highest quality of broadcast journalism. This is the second consecutive year that WFDD has been recognized in the “Overall Excellence” category. WFDD News Director Emily McCord says the body of work included coverage of several breaking weather events, civic literacy programming in the run-up to the election, the listener-driven series Carolina Curious, and “Unsafe Haven” – a documentary that explores the housing issues the city of Greensboro faces after five refugee children were killed in an apartment fire. WFDD competes in a region that includes large market radio stations in North Carolina, South Carolina, West Virginia, Tennessee, and Kentucky. Regional winners automatically advance to the national Edward R. Murrow Awards competition, with winners being announced in June. President Nathan Hatch emailed this message to students, faculty and staff on April 24, 2019. It is my pleasure to inform you that Wake Forest University has chosen Jane Aiken to become the next Dean of the School of Law, effective July 1. Dean Aiken comes to Wake Forest from Georgetown Law, where she has been a professor and administrator since 2007 and currently serves as the Blume Professor of Law. Her distinguished career as an attorney, an advocate and a teacher-scholar – particularly in the areas of legal education, women’s rights and evidence – makes her exceptionally well qualified to lead our School of Law. Her leadership, vision and energy are exactly what we need to develop the brightest legal minds in the tireless pursuit of justice. At Georgetown, Dean Aiken founded the Community Justice Project to enable students to represent clients in cases involving questions of justice where remedies are often transactional, policy-based or require extraordinary measures for adjudication. She has served as Associate Dean for Experiential Education and then Vice Dean for the Law Center, and she currently chairs the University Task Force on Gender Equity. Prior to joining the Georgetown faculty, Dean Aiken was the William Van Cleve Professor of Law at Washington University in St. Louis. While at Washington University, she was selected as a Fulbright Scholar to teach law at Tribhuvan University in Kathmandu, Nepal. She has also taught in law schools at University of South Carolina and Arizona State University. I am grateful to members of the search committee – chaired by Provost Rogan Kersh and guided by members of the Board of Trustees, Board of Visitors, faculty, staff, and law students – for bringing Dean Aiken to Wake Forest. I am confident her leadership will further strengthen Wake Forest’s position among the nation’s top law schools and I look forward to welcoming her to campus. Christina Soriano, associate provost for the arts, has been named a 2019-2020 Kennedy Center Citizen Artist Fellow. Soriano, who is also associate professor of dance and director of the University’s dance program, is one of eight change-makers in the United States who will begin a one-year fellowship at the Kennedy Center Arts Summit on April 29. 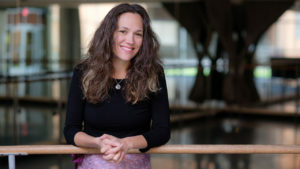 She researches how improvisational dance can improve brain health in older adults. She is widely recognized as the creative force behind an integrative method of dance that emphasizes physical and mental fitness for those with neurodegenerative diseases. The Citizen Artist Fellows program recognizes artists nationwide who use their art form for positive impact on communities. It was launched in 2016 as part of the center’s celebration of President John F. Kennedy’s legacy through his ideals of courage, freedom, justice, service and gratitude.